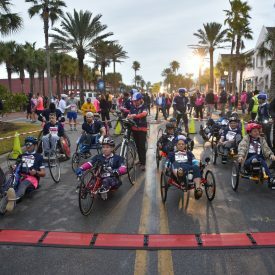 The reimagined 12th Annual DONNA Marathon Weekend took place in Neptune Beach, Fla., on February 9-10, and concluded with nearly 7,000 runners from all 50 states and nine countries. The move of all weekend events to the beaches was hailed an overwhelming success with faster times recorded in nearly every event, including an event record in the Ultramarathon for Marc Burget of Jacksonville, finishing 110 miles in 14:42:43. DONNA Marathon Weekend is an official event of The DONNA Foundation. The DONNA Foundation, a private non-profit organization in Northeast Florida, provides financial assistance and support nationwide to those living with breast cancer and funds groundbreaking research. To date, the foundation has served more than 11,000 families by providing more than $5 million dollars in relief. Big Run Media managed the event’s digital marketing and creative solutions for the third year in a row, utilizing their expertise of Facebook and Google Ads to drive registrations and grow awareness for The DONNA Foundation. In addition to digital advertising, Big Run Media provided creative design services and brand management. The team conceptualized the 2019 campaign theme, #TogetherWeWill, to give the event a consistent look and feel throughout the year. The visuals emphasize community and togetherness— trending values for runners in 2019 that were incorporated into the event’s social media, email and ad campaigns. The DONNA Marathon also used Big Run Media’s in-house design team for premium and medal designs. In lieu of a traditional ambassador program, the team looked for influencers with a direct connection to the race, and found Lindsey Hein. Hein had a prophylactic mastectomy in 2013 after discovering she carried a BRCA 2 gene mutation that put her at a high risk for breast cancer. Tapping into her highly engaged audience from her “I’ll Have Another with Lindsey Hein” podcast, Hein drove awareness, registrations and raised over $10,000 for the DONNA Foundation. The DONNA Marathon achieved a 10.3% increase in overall revenue (YOY) and a 13.6% increase in total registrations, including a 35% jump in registrations for its sold-out 5k. The merging of Big Run Media’s marketing strategy and The DONNA Foundation’s drive towards a higher purpose provided a winning combination that led to an incredibly memorable weekend. With three consecutive years of increased success behind them, Big Run Media has no doubt that next year’s event will be an even greater success. The 13th Annual DONNA Marathon Weekend is set for February 7-9, 2020. Big Run Media, LLC is a full-service branding, digital marketing, and creative design agency built by runners that focuses on endurance events and active lifestyle brands. As the world of digital marketing becomes more fast-paced and unforgiving, Big Run’s mission is simple: get more athletes to your start line and draw more fans devoted to your brand. Much like an athlete preparing for a goal race, Big Run Media develops your message into peak form by strategically tackling endurance event marketing and advertising challenges. From small-town 5k’s to big-city marathons, they work with you every step of the way to ensure your vision becomes a reality. The DONNA Foundation, a private non-profit organization in Northeast Florida, provides assistance and support nationwide to those living with breast cancer and funds groundbreaking research to finish the disease once and for all. The organization participates in a variety of community outreach initiatives, educational programs and fundraising events yearly to support its mission, including hosting the only national marathon to finish breast cancer – The DONNA. To date, the foundation has served more than 12,000 families in need and disbursed nearly $6 million to fuel programs that move families from a place of fear to a place of love.